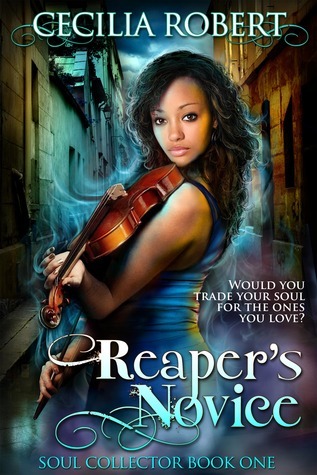 Thanks to AToMR Tours, we're pleased to present a review for a brand new YA paranormal book, Reaper's Novice, by Cecilia Robert. Keep scrolling to check out our review and then enter to win all sorts of swag for yourself! I love the idea of books about Grim Reapers but have been burned before, so I was a bit wary going into this once. However, I found that I enjoyed reading Reaper's Novice, which focuses on Ana, who gives up her soul and serve as a Soul Collector to save her family after a horrific car accident. The story is set in Vienna, which makes for a beautiful, historic backdrop for the events. Ana is a character who is absolutely devoted to her family and friends. She was written very realistically, and you could really feel her pain when her family was pulling apart, and her grief when she thinks that they are all dead. She is a normal teenage girl who, despite her new status as apprentice to the Grim Reaper, still has to worry about going to classes and maintaining relationships with her friends, on top of her new duties of Soul Collector. The cast of characters here is very rich and well developed, including Ana's school friends and Zig, a fellow Soul Collector who helps teach Ana many of her duties. We don't get to see much of Grim/Ernest, but I suspect he'll play a larger role in the following books in the series. Each character plays a different role for Ana in her new life, and it was a refreshing change of pace to read a book where the character has so many supportive people in her life. There are ups and downs, of course, but overall Ana has a great bunch of people surrounding her, and it's easy to see why she's so devoted to them. Also, can we talk about the cover for a moment? I mean, look how accurately it shows Ana! It's sad how rare it is to see a person of color on a book cover, so I was overjoyed to see that she was accurately represented on the cover of this one. More of this, please! As more elements were introduced into the story, I felt that it got a little convoluted, and there were a lot of minor characters to keep track of, which made it a little difficult to be able to put this book down for a bit and be able to pick it up quickly without backtracking. I did feel like the writing was maybe a little overly wordy, and there were some awkward or stilted phrasings that I wished had been smoothed out in editing, but nothing too bad. Aside from some physical violence, death, and kissing/making out scenes, this is a very clean read. Thank you so much for hosting me on your blog today, for reading & reviewing Reaper's Novice and for liking the cover plus so much more *hugs* I'm really glad to hear you enjoyed the story. Coranne, Sarah and Ericka, you girls made my day. :D Have a wonderful day! I haven't read a lot of books with Grim reapers...but I have loved the one's Ive read. This one sounds like another one I could really sink my teeth into. Thanks for the amazing giveaways as well!